To find a hotel with a good restaurant is quite easy. To locate a theatre with a good restaurant is, again, quite easily done too. But to discover a hotel with a good restaurant and its own theatre is a scarcity and quite something else. Such is the case at Kilworth House. Situated in Leicestershire, just a few minutes from Junction 20 of the M1, this superb venue has a timeless elegance and is set on an enchanting, expansive estate of some 38 acres of beautiful parkland, reflecting the character which this grand 19th century country house has to offer. Victorian finery with modern-day comforts can be very much enjoyed at Kilworth House. Having 44 really lovely bedrooms, with wonderful views of the grounds, this venue really deserves to be enjoyed. 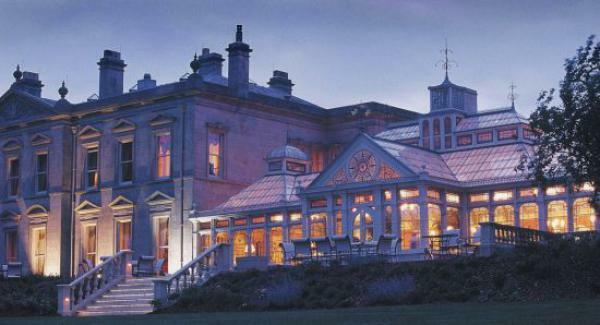 As a surprise for my wife Barbara, I arranged a short ‘escape’ for us to Kilworth House Hotel and Theatre. Situated at the end of a long, beautiful tree-lined approach, Kilworth House Hotel stands proudly within the magnificent estate, which even boasts a most delightful lake – if your fancy is to enjoy some fishing – and a really welcoming health and beauty spa area, offering a full range of treatments, from facials and massages, to more complex age-defying and total holistic body care experiences. Having a choice of two impressive restaurants and also several private suites to accommodate any occasion, Kilworth House is perfect as a choice of venue. The Wordsworth Restaurant is truly magnificent, with an ornate ceiling, stained glass windows and menus plus wine lists to satisfy everyone and every diet. Using the finest local produce, Executive Chef Carl Dovey changes the menus regularly to reflect the seasons and the splendid cuisine does tempt diners from far and wide. The Orangery Restaurant is perfect for less formal dining, with superb views of the estate. The award-winning Kilworth House Theatre with an auditorium of 550 comfortable seats, in tiered rows, hosts many shows, concerts and musicals. ‘Oklahoma!’, ‘Crazy For You’, ‘The Pirates of Penzance’ and ‘The Opera Show’ have been, and will continue, along with many others, to be performed at this magnificent venue. For our visit Barbara and I had the pleasure of enjoying ‘Guys and Dolls’. Having won many awards this Broadway musical is set in New York with much singing and dancing. Music and lyrics are by Frank Loesser and the unforgettable songs of ‘Luck Be A Lady’, ‘If I Were A Bell’ and ‘Sit Down, You’re Rockin’The Boat’, plus many others, are known by everyone. The professional production, equalling West End, London, performances had the cast of gamblers, cops, crooks and dancers making their colourful way through a vibrant New York City as the story unfolds. Not to give too much away about the story Barbara and I found the professional standard of acting very high and certainly most enjoyable. The production was directed and choreographed by Mitch Sebastion with the musical supervision and direction by Matthew Freeman, both of whom are no strangers to producing shows and musicals of exceptional quality. The audience was certainly most appreciative of the hard work which goes into these musical productions. Kilworth House Hotel Theatre‘The Opera Show’, again directed by and choreographed by Mitch Sebastion, also conceived by him, is another fantastic show. With really beautiful music, perfectly performed in spectacular fashion, this is again, a ‘not to be missed’ show. 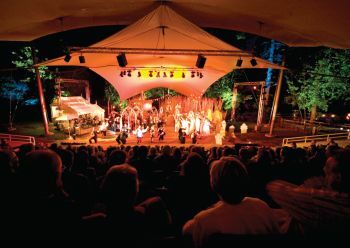 ‘The Opera Show’ had its world premiere at Kilworth House in 2008 and returned a year later selling out before the first night. These shows, concerts and musicals are on stage at Kilworth House for varying lengths of time – some for days, some for weeks – with many performances being sold out well before opening. A superb three course lunch or dinner can be enjoyed, to add to the most pleasant visit and with the theatre bar and champagne bar it all makes for a very memorable occasion. If a longer break is to be enjoyed then how about a pre-theatre dinner served in the hotel, tickets for the show and bed and breakfast – now there’s an idea for a future occasion! Having two AA rosettes for fine food and four stars, the Kilworth House Hotel and Theatre is most definitely worthy of several visits. Barbara enjoyed her surprise and we both came away with memories which will linger for a long, long time. Weddings, receptions and conferences – indeed any visit, or celebration – will be memorable.